Cover baking sheet with parchment. Reserve 1 Tbsp. melted green candy coating for later use to attach the cookies. Drop spoonfuls of half the remaining melted green candy coating into 12 mounds on prepared baking sheet. Use knife to spread coating into irregular shapes to resemble puddles. Dip marshmallow halves, 1 at a time, into remaining melted green candy coating, turning to completely coat each marshmallow half; place on puddles. Top with belt candy pieces for the witches' hair; add candy button eyes. 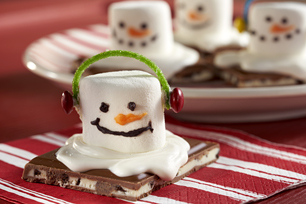 Use reserved melted green candy coating to secure cookies to the marshmallow head. Line shallow pan with parchment. Dip 2/3 of the pointed end of each corn snack into white candy coating; sprinkle bottom half of each coated section with orange colored sugar as shown in photo. Place in prepared pan. Freeze 5 min. or until firm. 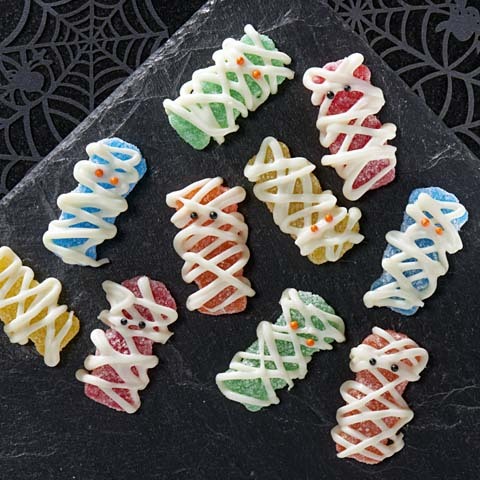 Dip uncoated ends of corn snacks into remaining white candy coating; sprinkle with yellow sugar to resemble candy corn pieces. Place on cookies, pressing gently into cookies to secure. Let stand until firm. 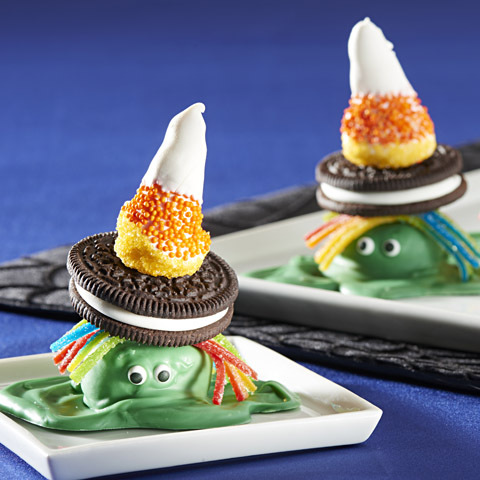 Size WiseHave fun making these witches with your kids, then sharing them with friends and family at your next Halloween party. NoteIf melted candy coating becomes too thick, add up to 2 tsp. shortening for each 16 oz. of candy coating wafers. 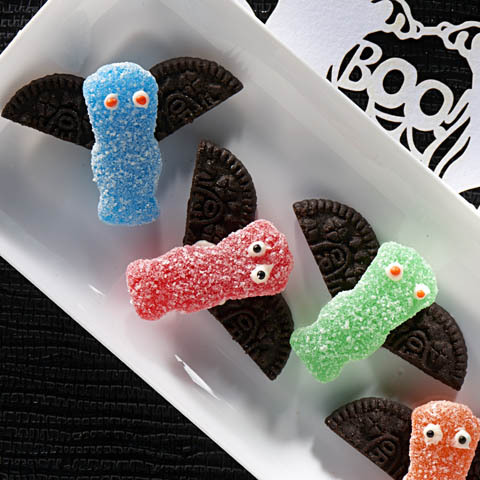 SubstitutePrepare using Halloween OREO Cookies.